This is it...my last customer quilt! Oh this is so hard for me. Here it is....my last customer quilt. 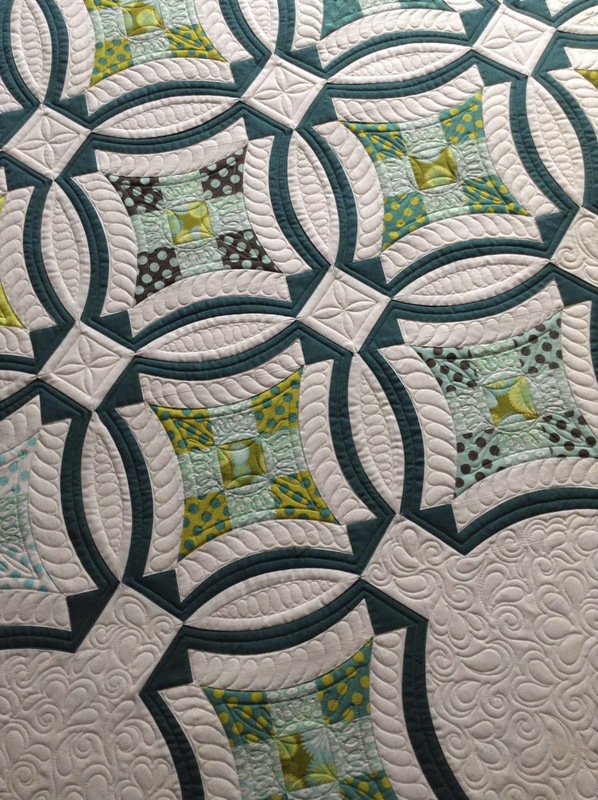 Becky's Urban Nine Patch was a gem to quilt up! I love everything about this quilt....the design...the colors...the layout. Like I said, this is my last customer quilt. I've got so many emotions going through me right now. 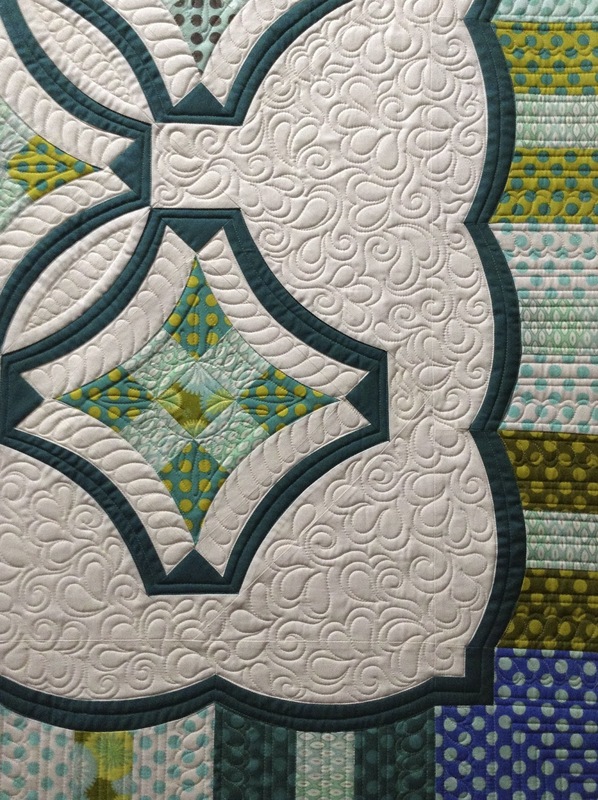 Check out the feathers for this quilt! They worked perfectly and even if you may not be into feathers....you can't tell me they don't look fantastic on this quilt! I went back and forth as to what design to do for the open white area in Becky's quilt and after a good night sleep, settled on my feather/swirl all over design. 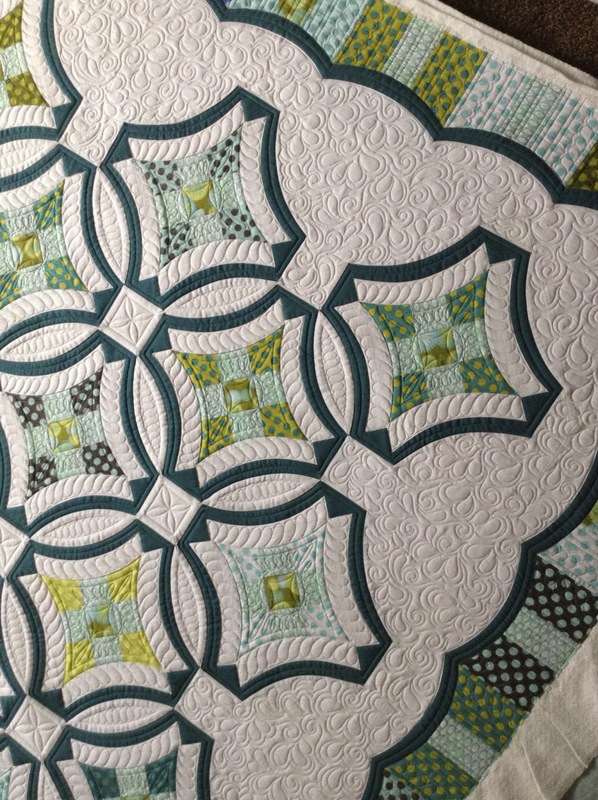 I didn't feel it needed more that that because the scalloped border is fantastic enough!! This quilt took me about 14 hours to quilt up. A lot of stitching in the ditch but very worth it! I love how the little white square looks like an art deco tile. I may just ask Becky for this one back for Market someday. It's so beautiful! Becky's piecing was phenomenal! ...and just in case you were wondering, my quilting posts will not end here. I've got plenty of my own creations to quilt up! My Professional Lonarm Quilting Business has been an amazing experience, some good and some not so good. I've had lot's and lot's of experiences good and bad that have happened along the way. I've met some amazing quilters and have developed priceless friendships. They've taught me so much and I'm so grateful for them. I love how longarm quilting has pushed me to be creative beyond anything I could have ever imagined. I love what's to come and have been truly blessed with my career path. 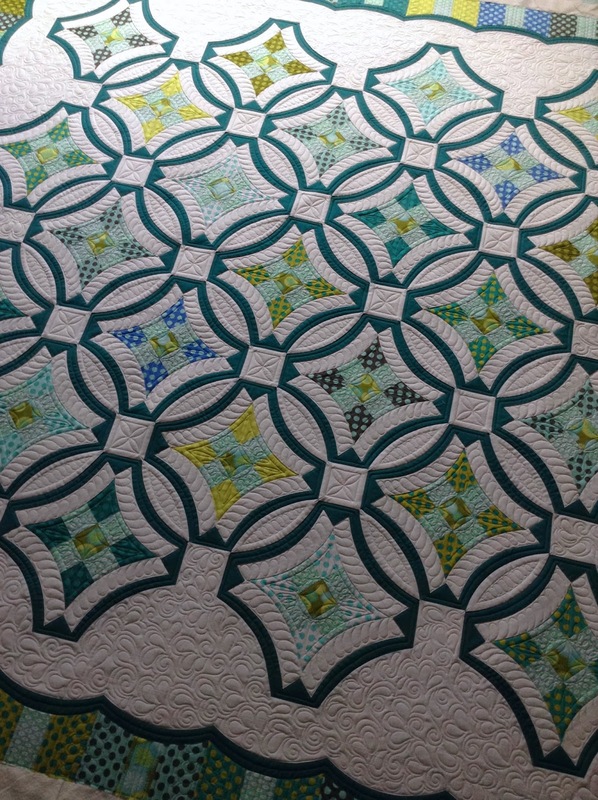 I hope that I can in some way or another use my longarm quilting skills to teach and inspire others somehow, someday and probably at another time. Okay...so I guess this is it! Look out for "Curves Ahead"!! Your work and your quilts are aminazg! Please continue to show us updates of your progress. I don’t think I have the dedication or patience to do this, but I can appreciate the love that goes into every little stitch. We are quilting a whole cloth quilt at church. We only quilt once a week, so it has been in the frame since June! Tim, I am currently qtuiling my peony quilt and I too am doing the outlining and a feathered wreath on the alternate blogs than going back to do the background qtuiling. I was contemplating doing some stippling in the center of the feathered wreaths. I wasn’t sure how it would look, but I guess one doesn’t know unless one gives it a go. Both of the quilts you are working on are wonderful.